Publisher provided review copy at no charge. Edgar loves hanging out with his best friend, Quincy, whether it's watching scary movies or building things. When he finds out his family is moving, he worries about leaving Quincy behind. Everything at Edgar's new school is alien to him. The kids look "weird" and listen to "bizarre music." It doesn't help that the biggest and weirdest kid of all keeps staring at Edgar. 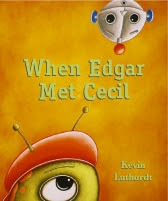 Is he about to scare Edgar to death when he introduces himself as Cecil or is there a budding friendship brewing? Edgar learns he must branch out of this world to find friendship with unlikely space creatures. Bright and zany illustrations add an additional fun dimension to a scary situation. The outlandish illustrations show that looking different is a two way street and that meeting new people can be quite entertaining.